The art of printmaking is witnessing an upward swing and artists in Goa are finding this genre of art viable, both in terms of creativity and commercial value. Originating in China in 105 AD, the ancient art of printmaking/graphic art found favour across the globe with European masters like Rembrandt and Goya. Although embraced in India around the 20th century, Goa was introduced to printmaking as early as 1556 with the advent of the first lithography machine in India. But the art form remained relatively obscure in Goa, up until a decade ago, when it began witnessing an upsurge. 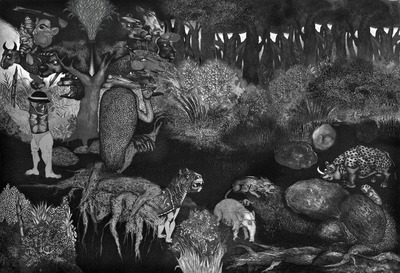 Carried forward by a committed community of versatile artists like Hanuman Kambli and Viraj Naik among others, over the years, particularly since the 1970s, the art form has not only evolved, but recently received a fillip with a national recognition for Swapnesh Vaigankar’s graphic print ‘Voyage’ by the Lalit Kala Akademi (2016). “Printmaking was the backbone of art in Goa with the arrival of the first lithography machine here. Although widely practised in India and around the globe, the awareness and importance of this art form is yet to be fully realised in Goa. Being a touristic place, Goa can easily become a hub for printmaking art,” asserts Swapnesh Vaigankar. Chosen for the unique qualities that each printmaking process lends to itself rather than the sole ability to produce multiple impressions, several artists have been turning to printmaking, interlinking various techniques like digital and litho or dry point and etching to achieve the desired effect. The acquisition of more etching presses has paved the way for more artists to practise this art form. “Technically when plates are etched, there is 10 times the possibility of giving softness to the work of art. With acid bites you can have 100 variations from one print. But ultimately the outcome depends on the sentiment and expression of the artist. Printmaking is an intricate process, but a flexible one too. It is a self-styled art in which the artist explores its various dimensions. But the softness of the visual is important. In printmaking the technique is the same for every artist, but it’s their individualistic expression that will define the work,” explains artist Viraj Naik, whose various experimentations led to the finesse his graphic art is now internationally acclaimed for.